Garden Update / July – Dig Delve – An online magazine about gardens, landscape, growing & making. It has been an extraordinary run. Day after day, it seems, of clear sky and sunlight. I have been up early at five, before the sun has broken over the hill, to catch the awakening. Armed with tea, if I have been patient enough to make myself one before venturing out, my walk takes me to the saddle which rolls over into the garden between our little barn and the house. From here, with the house behind me and the garden beyond, I can take it all in before beginning my circuit of inspection. It is impossible to look at everything, as there are daily changes and you need to be here every day to witness them, but I like to try to complete one lap before the light fingers its way over the hedge. 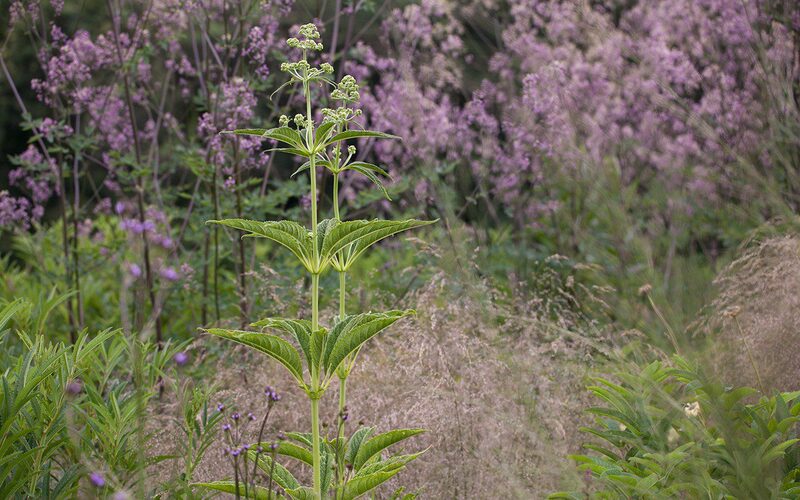 Silently, one shaft at a time, catching the tallest plants first, illuminating clouds of thalictrum and making spears of digitalis surrounded in deep shadow. It is spellbinding. You have to stop for a moment before the light floods in completely as, when you do, you are absolutely there, held in these precious few minutes of perfection. Now that the planting is ‘finished’, the experience of being in the garden is altogether different. Exactly a year ago the two lower beds were just a few months old and they held our full attention in their infancy. The delight in the new eclipsed all else as the ground started to become what we wanted it to be and not what we had been waiting for during the endless churn of construction. We saw beyond the emptiness of the centre of the garden, which was still waiting to be planted in the autumn. The ideas for this remaining area were still forming, but this year, for the first time, we have something that is beginning to feel complete. Of course, a garden is never complete. One of the joys of making and tending one is in the process of working towards a vision, but today, and despite the fact that I am already planning adjustments, I am very happy with where we are. 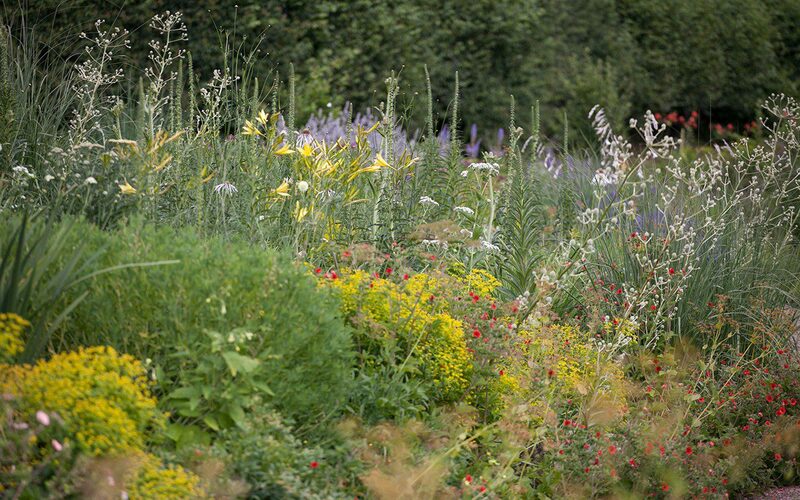 The paths lead through growth to both sides where last year one side gave way to naked ground, and the planting spans the entire canvas provided by the beds. You can feel the volume and the shift in the daily change all around you. It has suddenly become an immersive experience. An architect I am collaborating with came to see the garden recently and asked immediately, and in analytical fashion, if there was a system to the apparent informality. It was good to have to explain myself and, in doing so without the headset of my detailed, daily inspection, I could express the thinking quite clearly. Working from the outside in was the appropriate place to start, as the past six years has all been about understanding how we sit in the surrounding landscape. So the outer orbit of the cultivated garden has links to the beyond. The Salix purpurea ‘Nancy Saunders’ on the perimeter skip and jump to join the froth of meadowsweet that has foamed this last fortnight along the descent of the ditch. They form a frayed edge to the garden, rather than the line and division created by a hedge, so that there is flow for the eye between the two worlds. From the outside the willows screen and filter the complexity and colour of the planting on the inside. From within the garden they also connect texturally to the old crack willow, our largest tree, on the far side of the ditch. This first outer ripple of the garden is modulated. 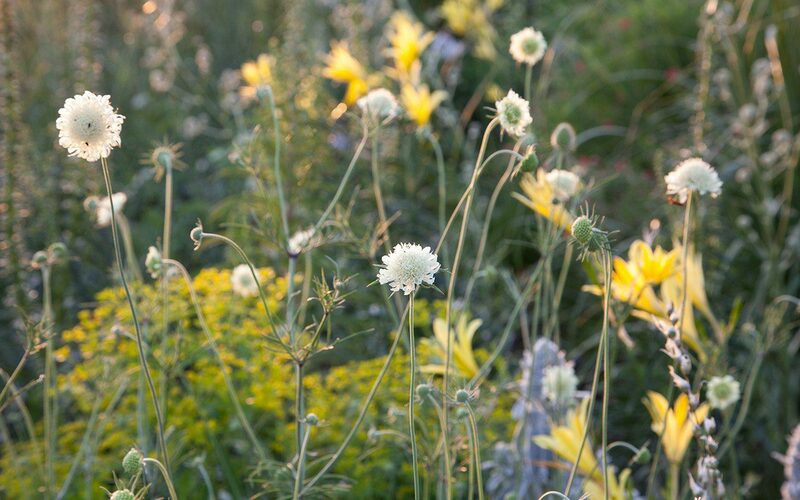 It is calm and delicate due to the undercurrent of the Deschampsia cespitosa ‘Goldtau’, but strong in its simplicity. 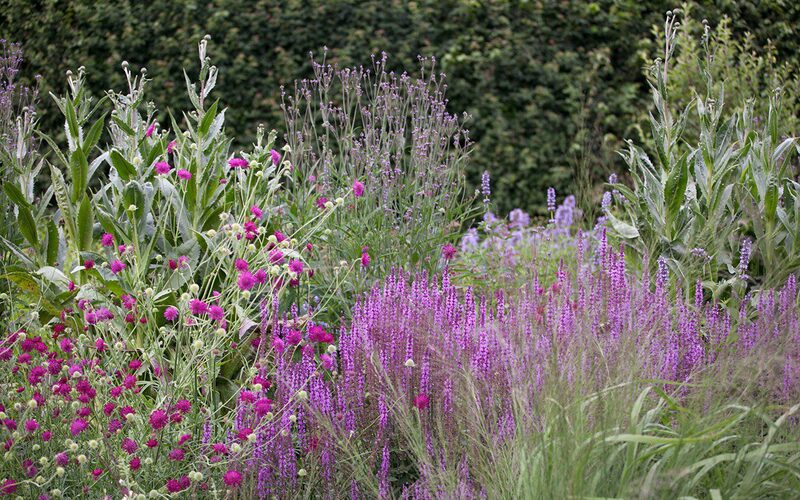 From a distance colours are smoky mauves, deep pinks and recessive blues, although closer up it is enlivened by the shock of lime green euphorbia, and magenta Geranium psilostemon and Lythrum virgatum ‘Dropmore Purple’. 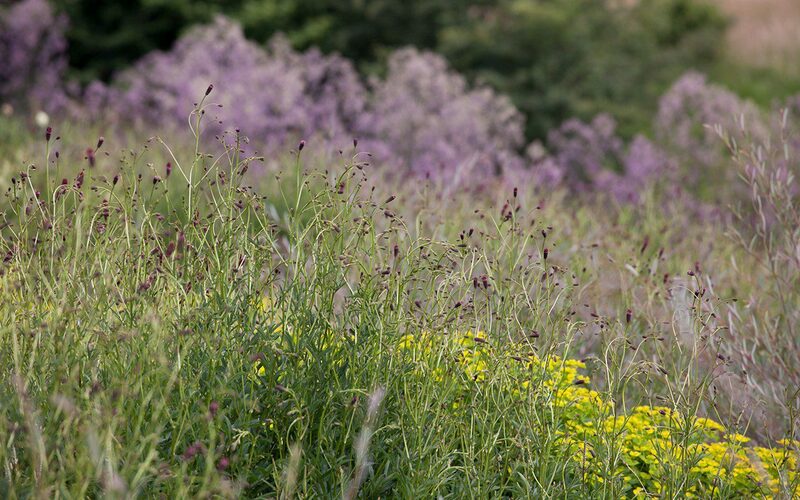 Ascending plants such as thalictrum, eupatorium and, later, vernonia, rise tall through the grasses so that the drop of the land is compensated for. 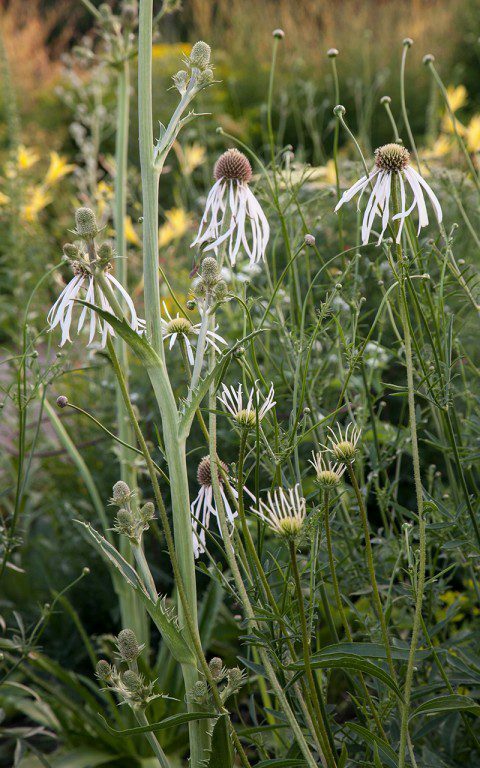 These key plants, the ones your eye goes to for their structure, are pulled together by a veil of sanguisorba which allows any strong colour that bolts through their gauzy thimbles to be tempered. 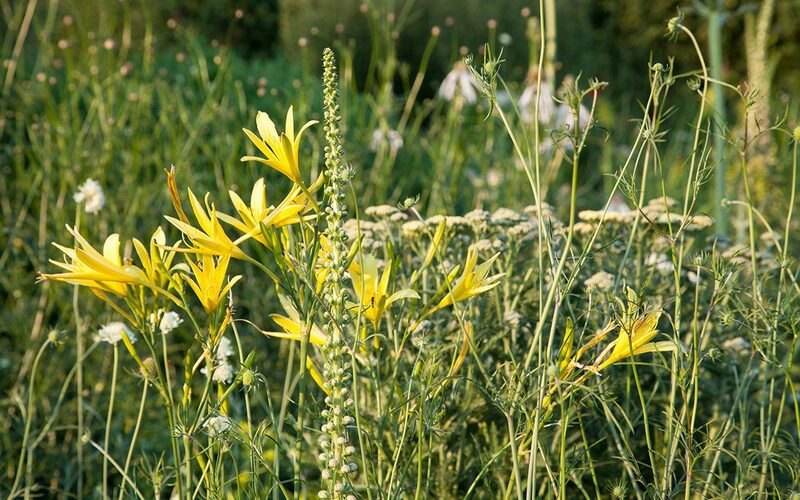 Overall the texture of the planting is fine and semi-transparent, so as to blend with the texture of the meadows beyond. The new planting, the inner ripple that comes closer but not quite up to the house, is the area that was planted last autumn. This is altogether more complex, with stronger, brighter colour so that your eye is held close before being allowed to drift out over the softer colour below. 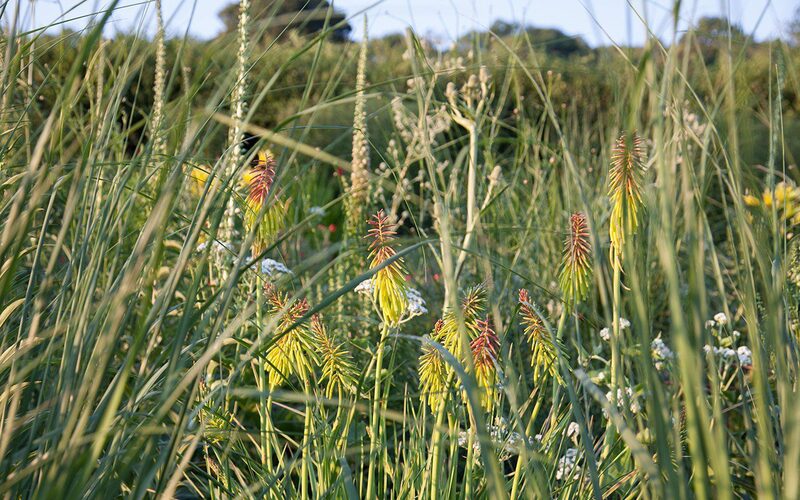 The plants are also more ‘ornamental’ – the outer ripple being their buffer and the house close-by their sanctuary. 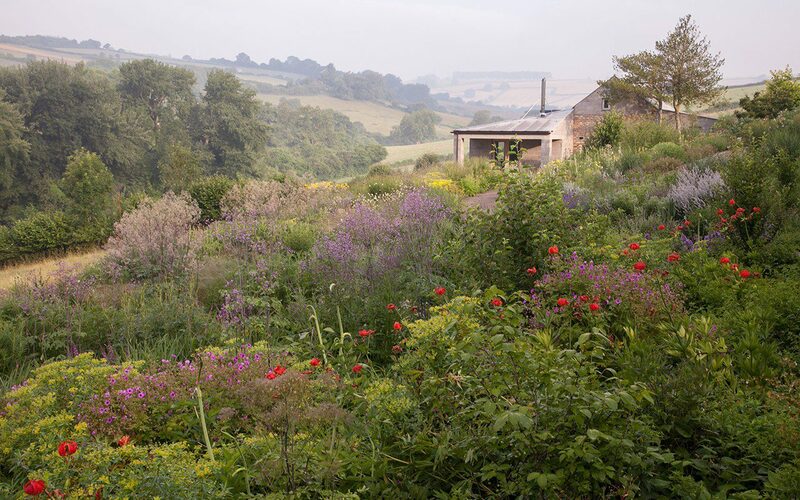 A little grove of Paeonia delavayi forms an informal gateway as you drop from the saddle onto the central path while, further down the slope a Heptacodium miconioides will eventually form an arch over the steps down to the verandah, where the old hollies stand close by the barn. In time I am hoping this area will benefit from the shade and will one day allow me to plant the things I miss here that like the cool. The black mulberry, planted in the upper stockbeds when we first arrived here, has retained its original position, and is now casting shade of its own. Enough for a pool of early pulmonaria and Tellima grandiflora ‘Purpurteppich’, the best and far better than the ‘Purpurea’ selection. It too has deep, coppery leaves, but the darkness runs up the stems to set off the lime-green bells. There is little shade anywhere else and the higher up the site you go the drier it gets as the soil gets thinner. This is reflected in a palette of silvers and reds with plants that are adapted to the drier conditions. 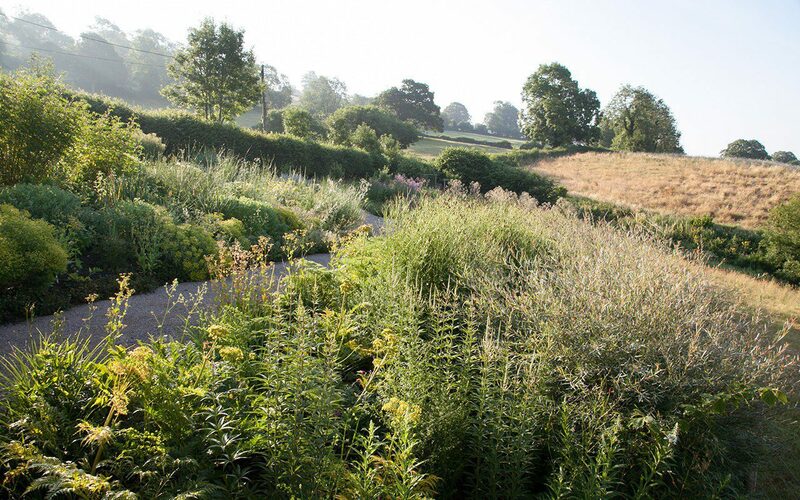 I am having to make shade here with tall perennials such as Aster umbellatus so that the Persicaria amplexicaulis ‘Blackfield’, which run through the upper bed, do not scorch. 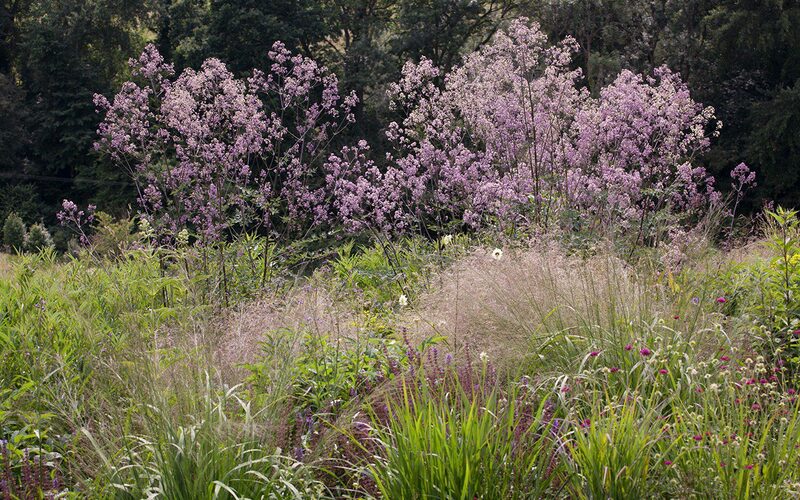 Where the soil gets deeper again at the intersection of paths, a stand of Panicum virgatum ’Cloud Nine’ screens this strong colour so it can segue into the violets, purples and blues in the beds below. I have picked up the reds much further down into the garden with fiery Lilium pardalinum. They didn’t flower last year and have not grown as tall as they did in the shelter of our Peckham garden, but standing at shoulder height, they still pack the punch I need. 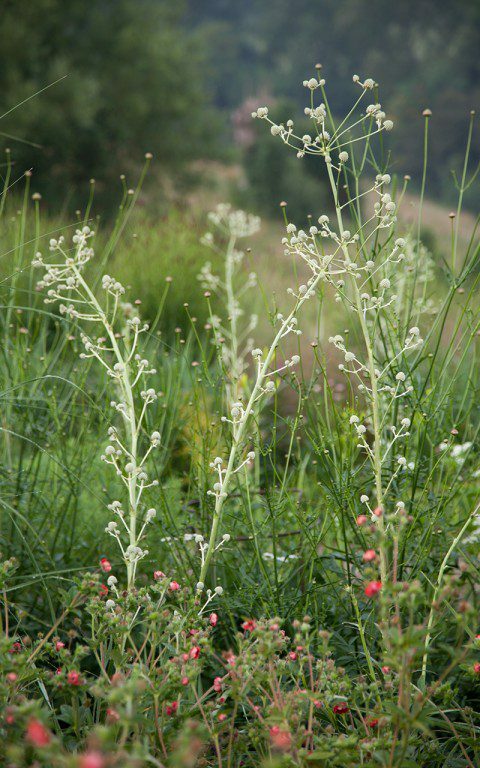 The central bed, and my favourite at the moment, is detailed more intensely, with finer-leaved plants and elegant spearing forms that rise up vertically so that your eye moves between them easily. Again a lime green undercurrent of Euphorbia ceratocarpa provides a pillowing link throughout and a constant from which the verticals emerge as individuals. 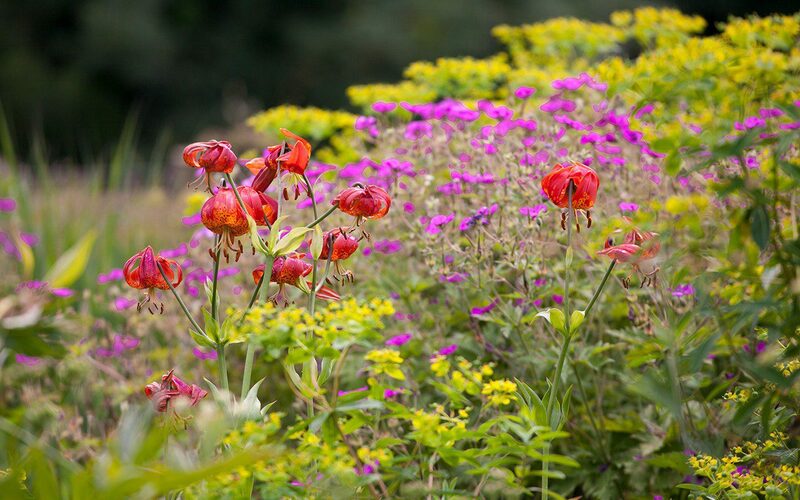 Flowering perennials are predominantly white, yellow and brown, with a link made to the hot colours of the upper bed with an undercurrent of pulsating red Potentilla ‘Gibson’s Scarlet’. 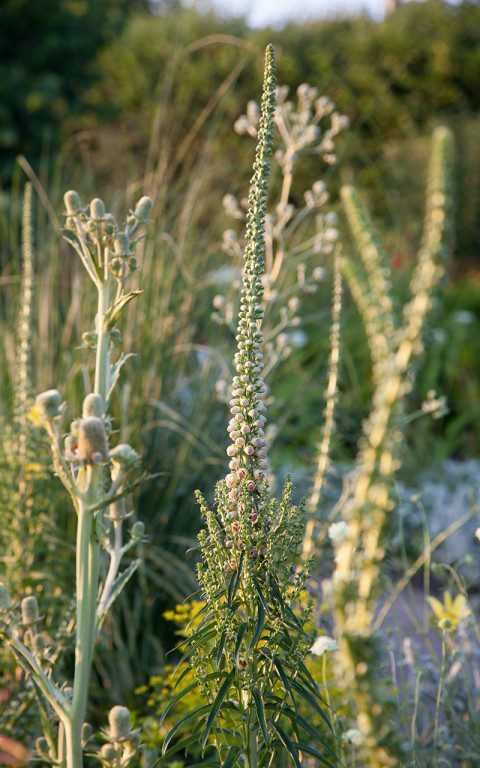 Though just in their first summer, the Eryngium agavifolium and Eryngium eburneum are already providing the architecture, while the tan spires of Digitalis ferruginea, although short-lived, are reliable in their uprightness. It has been good to have had the pause between planting up the outer beds in spring last year, before planting the central and upper areas in the autumn. 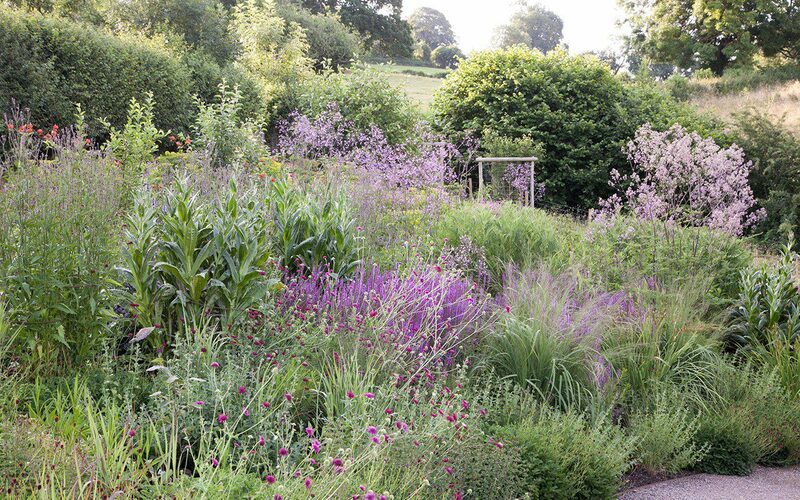 We are now seeing the whole garden for the first time as well as the softness and bulk of last year’s planting against the refinement and intensity of the new inner section. Constant looking and responding to how things are doing here is helping this new area to sit, and for it to express its rhythms and moments of surprise. I am taking note with a critical eye. Will Achillea ‘Mondpagode’ have a stay of execution now that it is protected in the middle of the bed ? Last year, planted by the path, it toppled and split in the slightest wind. Where are the Rudbeckia subtomentosa ‘Henry Eilers’ and, if they have failed, how will I get them in again next year when everything will be so much bigger ? Have I put too many plants together that come too early ? Too much Cenolophium denudatum, perhaps ? How can this be remedied ? Later flowering asters and perhaps grasses where I need some later gauziness. Will the Dahlia coccinea var. palmeri grow strongly enough to provide a highlight above the cenolophium and, if not, where should I put them instead ? The season will soon tell me. 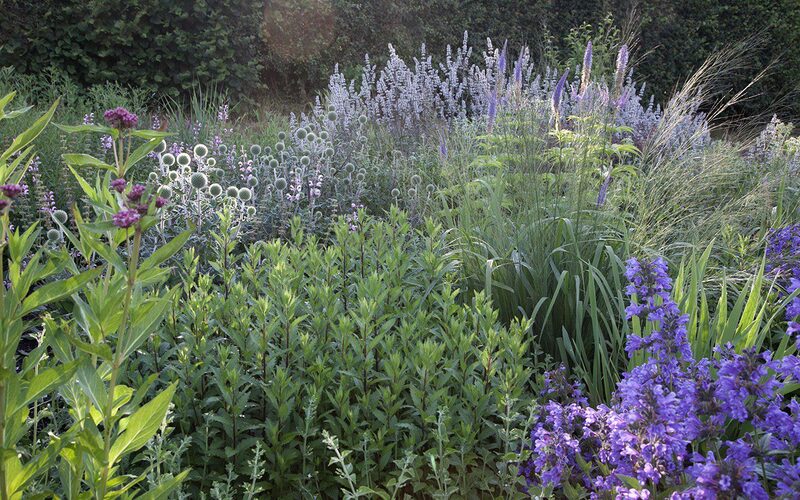 The looking and the questioning keep things moving and ensure that the garden will never be complete.